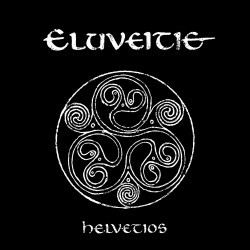 Helvetios is the latest album from Swiss folk metal band, Eluveitie. Eluveitie's brand of folk metal is hard and heavy - at times almost thrash, but with celtic influences and plenty of use of traditional instruments including fiddles, flute, bagpipes and the Hurdy Gurdy - Eluveitie are the only metal band I've seen who play the Hurdy Gurdy live on stage. This use of traditional instruments adds depth and interest to the music and emphasises the folk and celtic elements. The album starts with the prologue - a spoken introduction that sets the scene. A celtic voice speaking with the sound of waves in the background talking about ancient battles, this serves to set the mood for the album. Title track "Helvetios" opens the album proper. Powerful guitars, growling vocals finished off with fiddle playing and occasional female backing vocals make this a really good heavy song. "A rose for Epona" is a track where the female vocals take the lead, whereas most of the album uses male vocals as lead with the female vocals relagated to a backing role. The track wors brilliantly well and the change in vocals really helps the song stand out and adds extra variety to the album. The album ends with the Epilogue - another spoken piece which is very atmospheric. The speaking part ends as some gentle music rises in volume. The use of only traditional instruments keeps the atmosphere well. Towards the end of the track, choral vocals are used to further enhance the atmosphere. A great way to end the album. With this album, Eluveitie show why they are considered to be one of the best folk metal bands around. The music is heavy - there's no way you'd describe it as rock, this is definitely heavy metal and yet the folk influences are clearly audible - and keeping the folk part alive when the music is this heavy isnt easy. "Helvetios" is an album that I'll be listening to again and again. This is a great album and is one that is well worth buying for all fans of folk metal.